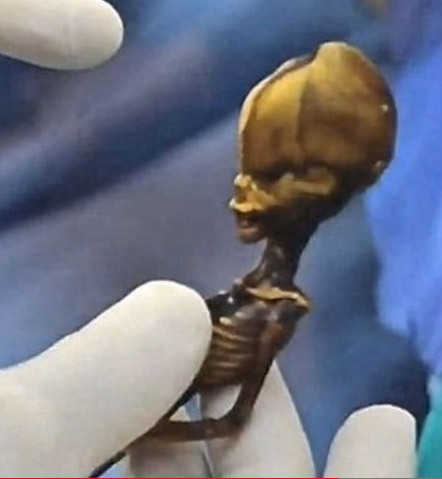 A teensy skeleton with a squashed alien-like head may have earthly origins, but the remains, found in the Atacama Desert a decade ago, do make for quite a medical mystery. Apparently when the mummified specimen was discovered, some had suggested the possibility it was an alien that had somehow landed on Earth, though the researchers involved never suggested this otherworldly origin. Now, DNA and other tests suggest the individual was a human and was 6 to 8 years of age when he or she died. Even so, the remains were just 6 inches (15 centimeters) long. Teensy Skeleton Credit: Sirius, YouTube Screengrab1. "While the jury is out regarding the mutations that cause the deformity, and there is a real discrepancy in how we account for the apparent age of the bones … every nucleotide I've been able to look at is human," researcher Garry Nolan, professor of microbiology and immunology at Stanford School of Medicine, told LiveScience. "I've only scratched the surface in the analysis. But there is nothing that jumps out so far as to scream 'nonhuman.'" The oddities found in the specimen's bones suggest some type of dwarfism, though "there is no known form of dwarfism that accounts for all of the anomalies seen in this specimen," wrote Dr. Ralph Lachman, professor emeritus, UCLA School of Medicine and clinical professor at Stanford University, in a report to Nolan. Credit: Sirius, YouTube Screengrab8. Nolan and his colleagues analyzed the specimen in the fall of 2012 with high-resolution photography, X-rays and computed tomography scans, as well as DNA sequencing. 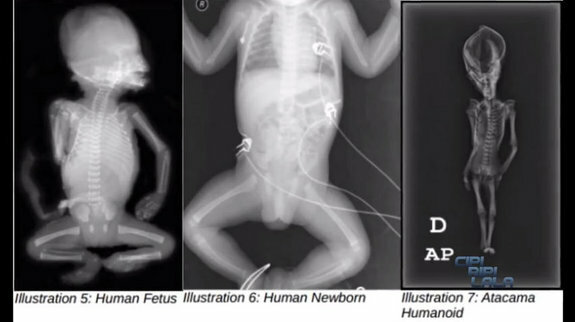 The researchers wanted to find out whether some rare disorder could explain the anomalous skeleton -- for instance it had just 10 ribs as opposed to 12 in a healthy human -- the age the organism died, as its size suggested a preterm fetus, stillborn or a deformed child, and whether it was human or perhaps a South American nonhuman primate. Garry Nolan, professor of microbiology and immunology at Stanford School of Medicine, and his colleagues analyzed the mummified specimen in the fall of 2012 with high-resolution photography, X-rays and computed tomography scans, as well as DNA sequencing. Credit: Sirius, YouTube Screengrab3. The remains also showed skull deformities and mild underdevelopment of the mid-face and jaw, the researchers found. The skull also showed signs of turricephaly, or high-head syndrome, a birth defect in which the top of the skull is cone-shaped. The skull showed signs of turricephaly, or high-head syndrome, a birth defect in which the top of the skull to be sort of cone-shaped due to the premature fusing of some of the skull's sutures, according to Johns Hopkins Pediatric Neurosurgery. Credit: Sirius, YouTube Screengrab2. The genome sequencing suggested the creature was human, though 9 percent of the genes didn't match up with the reference human genome; the mismatches may be due to various factors, including degradation, artifacts from lab preparation of the specimen or insufficient data.